It was used as gifts for whole family. They are beautiful. The only thing I did not like was that they were a bit pricey. I would definitely buy this product again!! Thanks again! 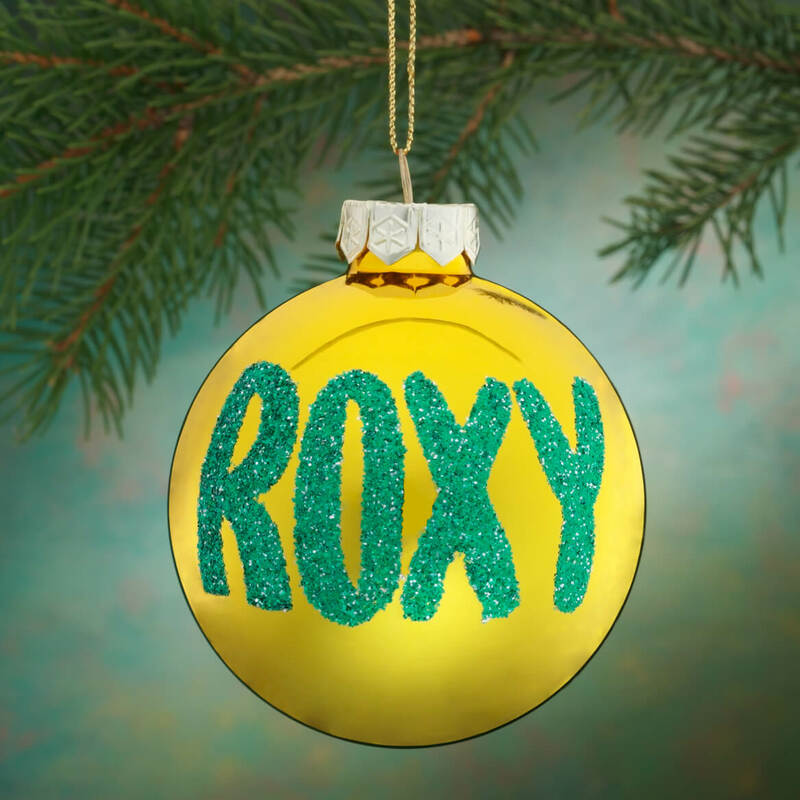 Thank you for my personalized glitter ornament! It completed my tree! I have been buying these for 18 years! We just added a new granddaughter to the family! I have a family tree with all the names of the family on it! Love the look! So classy! I have been buying from Miles Kimball for many years! Great company ! Love it! I have a white Christmas tree that I decorate with only red and glitter name bulbs been doing it since 1970 As my family grows so does the number of bulbs. And everyone comes in looks for their bulb and usually moves them to suit themselves. Lots of Fun and Laughs. Bought this back in 1980 for each of my 4 children. Also for 3 of their friends that would come to visit. They each enjoyed having "their own" Christmas ball to hang on our tree.It was a great tradition. We BOUGHT THIS FOR OUR PASTOR AS A GIFT. I HOPE HE LOVE IT AS MUCH AS I DO. IT IS SO BEAUTIFUL! Love our family personalized ornaments! Adds family to our Christmas tree. Love hanging the ornaments on our tree each year. We make sure they get placed in front on our tree! These ornaments have been a tradition in our family for over 40 years. This year I ordered them for my husband & our twin boys. The quality & beauty of each ornament is exceptional. When they arrived, one was broken. We were crushed, literally. Miles Kimball couldn't have been more gracious in handing our issue & sending a replacement immediately, so we would have it in time to hang on the tree for Christmas. I have bought many of these over the years & have never had a problem. Each time we get a new family member,I get a new ornament. This year,we got 4 new members! I'm runnung out of room on my tree! Name balls are part of our Christmas. My mother gave two name balls to my husband and me for our first Christmas 52 years ago. She later gave us one for each of our three children for their first Christmases. I have taken over the tradition and we now hang on our tree every year your name balls for our three children, their spouses, our five grandchildren and now our three step grandchildren -16 in all. We have had these since I was a child. My parents got them for my kids. My oldest is almost 22! His ornament is a little faded, but still intact! We each put our ornament on the tree and then we finish decorating together. I have ordered the personalized ornaments from Miles Kimball for over 35 years. I have one for each of my kids; of course, we have to have one for each of the pets - those old, new and no longer with us. Only a few of these ornaments have had to be replaced due to breakage or old age; but, overall, they are durable and retain their colour for a long time. These ornaments are not only a family tradition; they are treasured heirlooms that contain cherished memories. 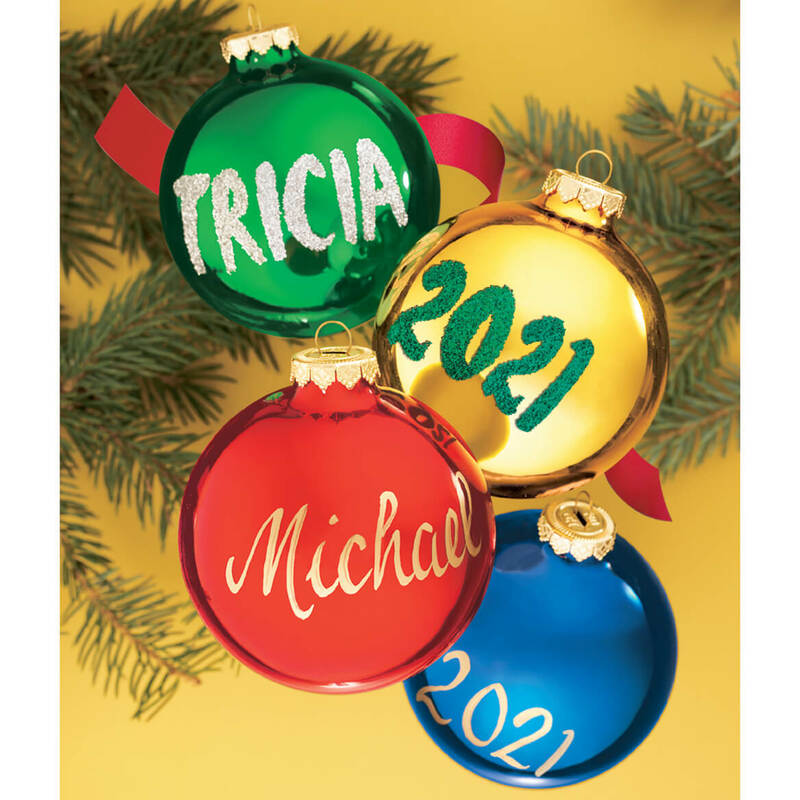 I was very pleased as to the way the ornaments came out when I first looked at the catalog I did not see the name and date option so I ordered them on line and they were available. I have used the ornaments a gift to my children when they were younger and now for our grand children. Quick and fast service and a pleasure to give. A Miles Kimball glitter ornament for each family member has adorned our Christmas tree for years. This year I will pass the tradition along to the next generation and present our married daughters with ornaments for their trees. To surprise my daughters, their new ornaments have been incorporated into our Christmas dinner centerpiece. [...] I had to email my preference after the order was submitted. Also, the ornaments arrived with 2010 on them and I would have preferred no date on them. This was a gift to a friend with four children. I personalized an ornament for each of her children.She was thrilled with the gift. However, I was thrilled and proud to present her with a gift that was beyond my expectations. These ornaments look like I spent a fortune, although I did not. They were so affordable. Thank you Miles Kimball for making me look like a super hero! Looks great on my Christmas tree! Very nice gift for someone you want to remember with special fondness or just to hang on your tree to always remember those you love. We have been buying these ornaments for 64 years! These ornaments are our family tradition. We each have one with our name and year we were born or year we got married. Each Christmas we hang them on our tree and they look so beautiful. I keep buying one for each grandchild we have! They are very unique! 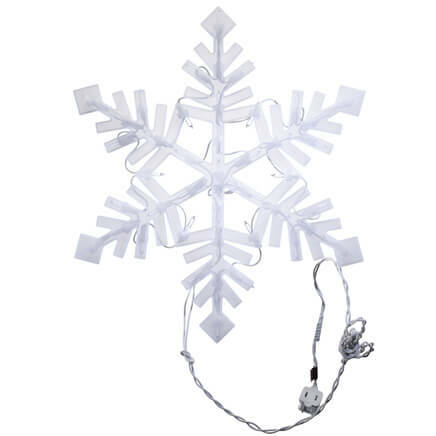 THESE ORNAMENTS WERE PERFECT I WOULD RECOMMEND THEM TO ANYONE FOR CHRISTMAS TREE. I buy an ornament for my nephew with his name on it every year. This was perfect! In a tradition that dates back over 60 years in my family it is good to have Miles Kimball here to help keep it alive. My order of ten ornaments was totally correct and arrived safely. Now my Grandchildren are part of a family tradition. Thank you for hese ornaments. Thank you for keeping these ornaments in your catalog. My collection with my grandchildrens names on them started about 5 years ago as a gift. As each new addition to the family ornaments were added. This year our tree fell over and three of them were broken and thanks to you I was able to replace them. I also added 2 new ones for spouses and 1 for a great grandson. Looking forward this coming coming year as we will have 2 new additions. The grandchildren look for their ornament each year. I don't want the date! I have had a Miles Kimball ball since a child, then my children had them and now the daughter in law and grandson! We never had the date growing up and despite saying I don't want the date, it always comes dated- ugh. As each year someone's breaks, we don't need year -just a name. I hope next year MK does not date it when I ask them not to- please!!!!!! I order these every year for any new member of the family, whether it be new baby, dogs, or people! People always ask me where I get them, so I tell them! I started buying this ornament 40 years now, because my grandmother bought them 20 years before! This is my Favorite that I order Several Ea Yr& Best price ! Great Gift & Best Pricing!! I order several every year !!! 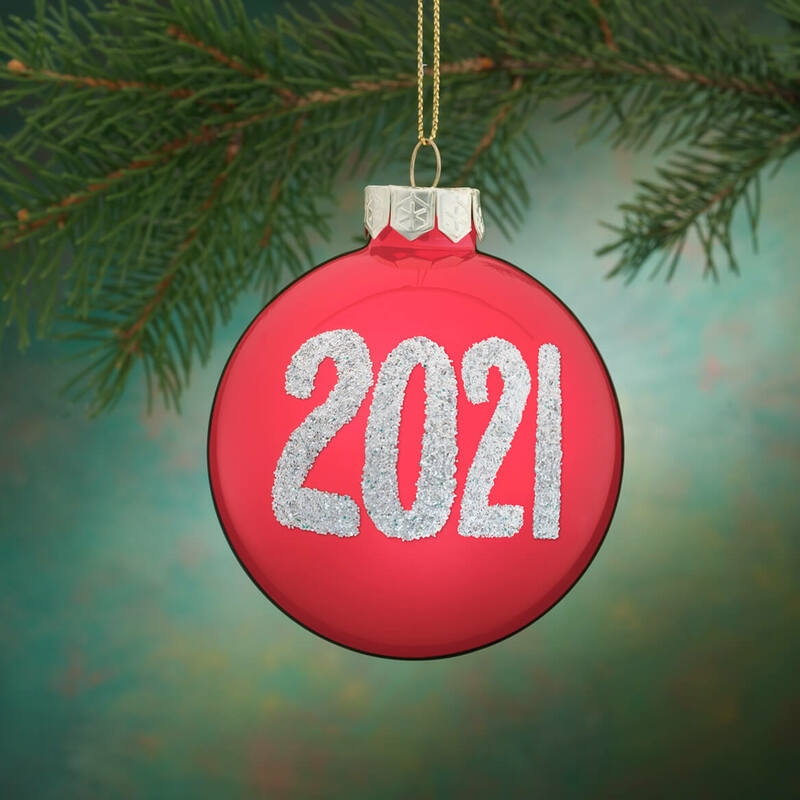 I have purchased one of these ornaments for every member of our family with their name and the year they were born. Each person adds their own to the Christmas tree, such a wonderful family tradition. I would have like the option of having the name in lower case instead of all CAPS. Matched pretty well with my original name balls from the 1980's. I ordered this as a replacement in a set from 1976. I'm so glad I did it! In 1980 I ordered these ornaments for our family of 5 plus my folks and my husbands folks. I have since then over the years easily ordered 100 more for friends and family. my kids are grown and they each have a full set for their trees also. I have 4 generations on my tree. I have had only 3 ornaments that weren't;t perfect. One had a small hole and two different ones were missing the date. Miles Kimball replaced them each time with no questions asked! Three out of 100 is a VERY good batting average. Our oldest ones still have all of their color but if you hold them up to the light you can see through them.I would highly reccomend them to ANYONE. We all love them and they are placed on the tree and then the rest of the ornaments are hung. We hang the ornaments for the ones who have passed away around the very highest branch for a place of honor! LOVE LOVE LOVE them! 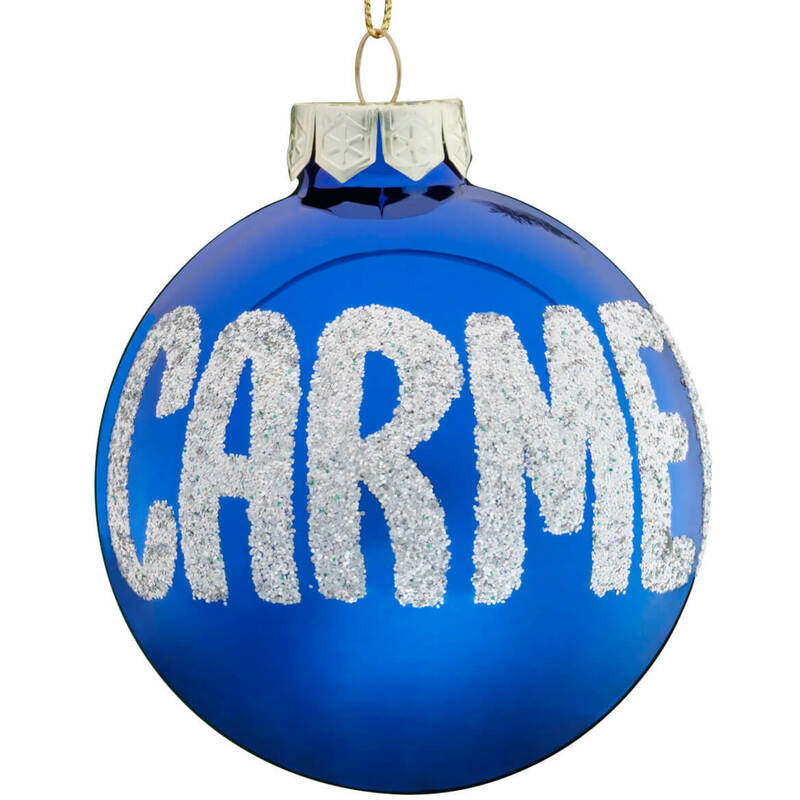 I have purchased these personalized Christmas Balls since the 1960's. Nieces, Nephews, Godchildren, Own Children & Grandchildren Treasure them! Love the classic quality glass ornament. Don't ever get rid of this great product. A family tradition continues. My mother started this tradition more than 50? years. I have been giving the ornaments for individuals or family gifts at Christmas, part of wedding gifts, anniversary and/or baby gifts......for the last 25? years. I am positive I ordered just the name ornament but when it came it had both the name and date on it. Since name is quite long, BRENNAN, adding the date makes them almost meet.I called customer service and was told,"no that's what you ordered" Needless to say, I am not happy. I and my mother before me have been long time Miles Kimball shoppers. My grandmother purchased these dated Christmas ornaments for years and sadly she has been gone for 10 years. This year while hanging them dated from 1984 to 2003, we decided it was time to start getting the glittery dated ornament once again. The glitter ball ornament has been a family tradition since childhood. When one broke this year we reordered. The only constructive criticism is that on the order form, I purposely left the date field BLANK because I did NOT want the ball dated. However, it did arrive with the year 2010 on the back - which is NOT what I wanted. Been Hanging These for Over 40 years! My grandmother bought these for each family member over 40 years ago. I can't remember a Christmas tree without them. Parents, grandparents, children and cousins all love their personal ornament and they are very important to us. Now I replace the broken ones just like my Grandma did decades ago. Have added one on our tree as a member of our family has been added. I was very happy with the product I purchased and very happy with how fast I received the shipment. If this were the first time I'd ordered these balls, I'd be very happy as they are very nice. However, for those of us ordering replacements, they are disappointing sas they are noticeably smaller than our earlier ones. I didn't ask for the year! Our family has purchased these ornaments for many years. I needed to replace them because a few of them were showing wear. I only wanted names on my ornaments and purposely did not ask for the year. Unfortunately, all of them arrived with the date on them. I was so disappointed. There is no significance to the year 2010 for us and now it is all six ornaments. I found this online shopping experience frustrating. The product is very nice [...]tax practically added up to what the item costed. Ornament was fine. Order was made with another item. This item was back-ordered and I was never notified. I have yet to receive notice. Lousy customer service. This is a tradition started by my mom from Miles Kimball, over fifty years ago. I have purchased for my children and grandchildren. My nieces and nephews and there families. Sometimes given for wedding gifts and then part of a baby present. This ornament has been on my mother's tree as long as I can remember. It has now become my tradition and is on my tree. I picked this because our family has been getting them for all our family. I got the first ornament 51 years ago when I got married. For different family members to remember year received and from whom. These have been a tradition in our family since I was a kid. Glad to see they still are available. It’s a tradition since the 70’s that every child and new dog in the family gets one of these ornaments and we have a new puppy named Maple and a new granddaughter named Abbie. Loved the card selection especially the ones I chose because it expresses how I feel about the Christmas holiday. Also chose the ornaments for my 3 Great Grandchildren because I had them for my own children when they were young. They still have them after 35 years. Family tradition. My daughter receives (1) personalized ball every Christmas (she is now 19). 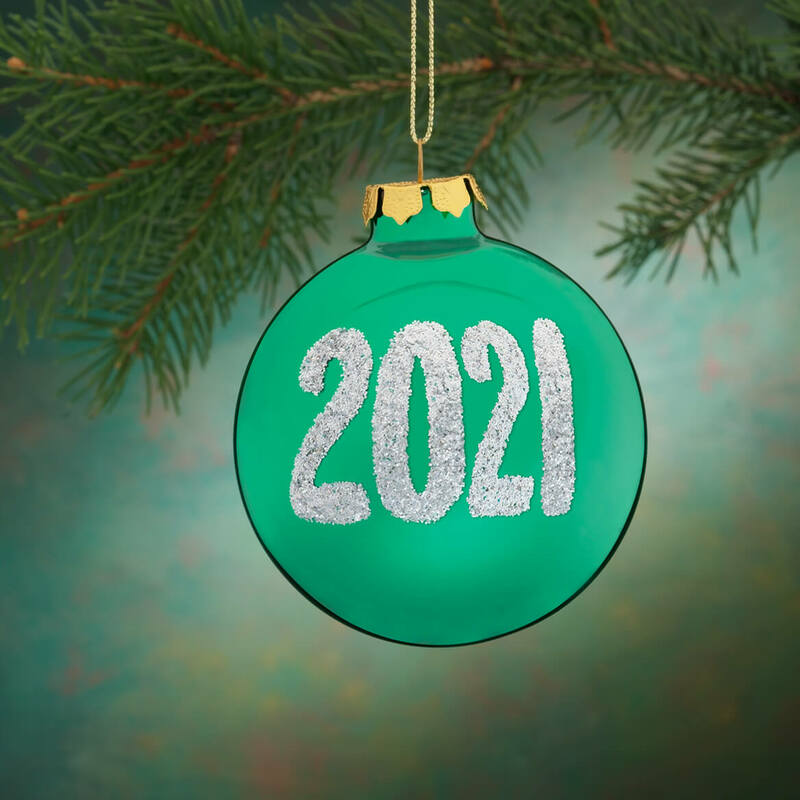 This ornament is a family tradition when a new baby is added to the family. purchase one for every new family member-- spouses and babies! Everyone in my family has one. It is tradition. I wanted to personalize this Christmas with my Son and my two grandchildren. I think this will be a great tradition. Tradition as we have one for every family member. We now have an additional Great Grandchild, so it was time to add another beautiful ball with Willow's name on it. Loved the way it looked. 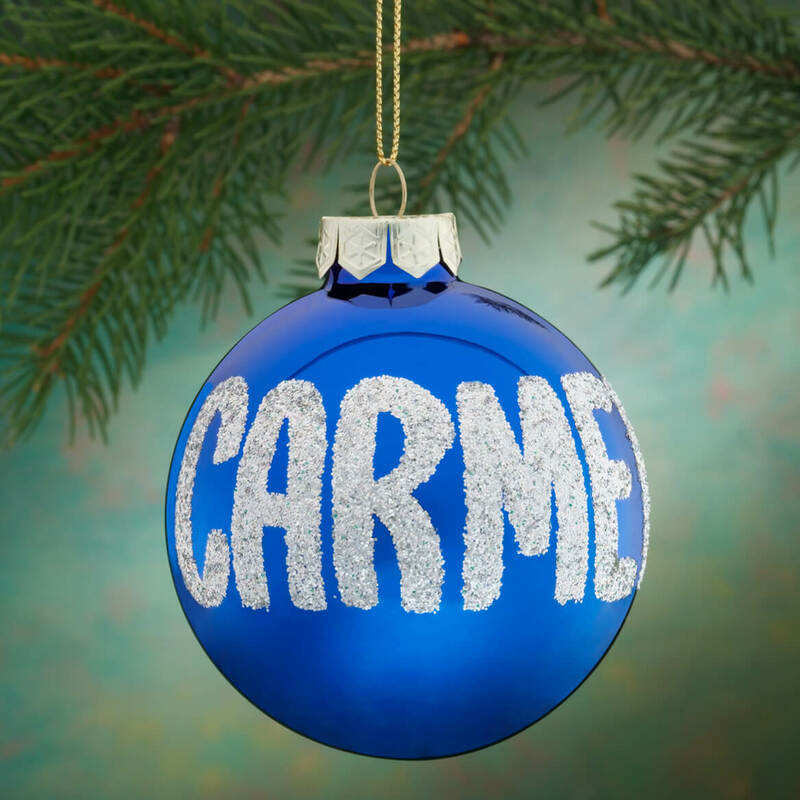 I love the personalized Christmas ornaments. I have one for ever member of my family. We have a new grandson this year so I ordered one for my tree and one for his house. These ornaments are a family tradition started by my great aunt more than fifty years ago. I have continued them. We are giving them to our great nieces and nephews now. Everyone enjoys seeing their name on the Christmas tree. Family tradition to have one for each family member on our tree! Our family has been getting an ornament every year since the 1970s or earlier. It started with my husband's grandparents and included every generation and new addition, be it a baby or new spouse or boyfriend/girlfriend. This year the newest addition is for my granddaughter. I have ordered them as gifts for family and friends for many years. Everyone is pleased to receive them. I think they are lovely. This has been a family tradition in our family since I was a little girl, my grandmother had every one of her kids, grandchildren, son and daughter in laws name ornaments on her tree, every year it was so fun to find your ball on the tree! Now I have all of my family name ornaments on my own tree. My family has been ordered these ornaments from Miles Kimball sine 1949. Tradition - have had our original ones for over 30 years! I have all family members names on an ornament on my tree. I love these!! Don't ever stop making them!! It wont let me make a selection? Is the lettering all the same size? BEST ANSWER: For the most part depending on the length of the name. If it is a really long name they have to make the letters small enough to fit them all on the bulb. We have ordered them many periodically over the years and we have liked them and are pretty much the same every year. I hope that helps you. Yes. I've ordered these ornaments for my family for the last 41 years - now on the 3rd generation. I love them. Yes all the letters are the same size. Yes, the picture is very accurate. How come one answer says green is no longer available and another says it’s seasonal and will be back. Which one is it? BEST ANSWER: Thank you for your question. All ornaments will be back in stock during the fall of 2018. We hope this information will be of help to you. When will the green be back in stock? BEST ANSWER: Thank you for your question. This is a seasonal item and green should be back in much closer to the Holiday season. We hope this information will be of help to you. The description lists silver glitter on green as an option, but it is not listed in the selection drop-down box. Is the green ornament still available? BEST ANSWER: Thank you for your question. Unfortunately the green is no longer available. We hope this information will be of help to you. What color of cap comes on the blue, green and red ornament? BEST ANSWER: Thank you for your question. The color of the cap is silver. We hope this information will be of help to you. Is it possible to use 15 spaces and no date? I would like an ornament to say - daughter-in-law. Is that possible? BEST ANSWER: Thank you for your question. Unfortunately your personalization will not fit. We hope this information will be of help to you.